This section gives some information on the areas and maps produced by Setanta Orienteers. 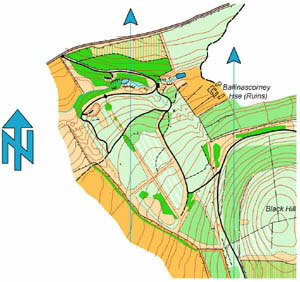 For those interested in the technology, orienteering maps are drawn using a special computer aided drafting system called OCAD. Maps are updated continuously to reflect changes in the terrain and the club actively pursues new orienteering areas for mapping. Orienteering maps are designed to give detailed information on the terrain to be traversed by the orienteer. They are drawn to a large scale, usually 1:15,000, 10,000 or 7,500 and show magnetic (compass) north direction lines. Maps are produced to an internationally agreed specification (http://lazarus.elte.hu/mc/) using standard colours and symbols, so it is possible to compete in other countries without language barriers. Event organisers will normally explain the map legend to beginners. Open land is shown in yellow tones while forest and other vegetation are shown in white and green tones to represent varying degrees of density/difficulty. Roads, tracks and rock features are shown in black while contours (normally at 5 metre intervals) and other ground features are in brown. Orienteering courses show the start, finish and control points that must be visited by the orienteer and must be marked onto the map. 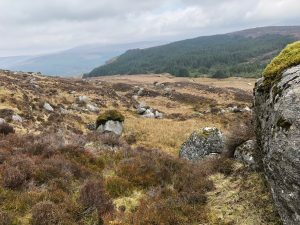 For local events this is normally done by the orienteer after starting but for larger and championship events the courses are pre-marked onto the maps and given to the orienteer at the start line.